Filing the petition — The parent who petitions for divorce or who files a stand-alone custody action asks the court to grant sole custody on the basis of specific facts. The law does not allow the court to favor one parent over another on the basis of gender. 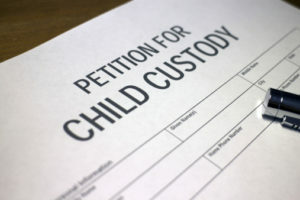 The petition must allege facts that allow the court to conclude the child would be in danger or suffer substantial disadvantages when living with the other parent. Allegations of drug or alcohol abuse, anger management problems, or physical or sexual abuse, if substantiated, can certainly sway the court. Facts that suggest the other parent’s lifestyle makes them not suited to be a primary caretaker can also be persuasive. A petitioner can also ask the court to grant temporary custody until the divorce or the custody case is final. The respondent’s answer — The responding parent must file an answer to the petition with the court. The respondent can either accede to the petitioner’s demands for full custody or oppose the demand and ask the court for sole or joint custody. Respondents can rebut allegations of unfitness and assert facts supporting their ability to provide a proper home and be a proper caregiver to the child. Mediation — After papers have been served, the court will order mediation according to N.C.G.S. § 50-13.1, the mediation statute. Mediation often works for parents who agree on the basics of custody, especially if they want a joint custody arrangement. When one parent wants sole custody, mediation rarely works unless the other parent concedes. The matter is often set for trial in the family court, along with other unsettled issues. Discovery — Whenever a dispute goes to trial, there is a period of evidence collection, called discovery. Attorneys for both parents seek to uncover facts that will help their client’s case by holding depositions, filing interrogatories, requesting documents, and even ordering physical and medical examinations. In some cases, the court may request that a child psychologist or social worker prepare a report. Trial — You can expect to spend about two full days and possibly more in court for the child custody issue. The court considers the evidence presented and, depending on the age and maturity of your children, may ask their preferences. The court will then issue its permanent child custody order. Anyone seeking sole custody of children should realize that serious allegations, if unfounded, can come back to haunt them. One of the factors the court considers in granting custody is the willingness of the custodial parent not to interfere in the noncustodial parent’s relationship with the child. The court is less likely to grant custody to a parent who has acted to alienate the child from the other parent. The standard the court uses when deciding child custody issues is “the best interest of the child.” In our experience, this is also the best standard for parents to adopt whenever they engage in a custody dispute. The Moore Law Office, PLLC represents parents and grandparents in Asheville and throughout Western North Carolina in child custody matters. To learn more about our firm, please call 828-333-4796 or contact us online to schedule a consultation at our Asheville office.